£82.50 Prices include 5% VAT for domestic and end-users. • Kiln dried softwood logs, bulk bag. 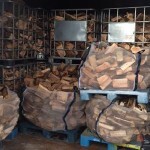 • Kiln dried logs are force-dried in our state-of-the-art purpose built kiln.